How is your money managed? Do you use the best possible tools available for financial management and savings? Speak to our experts about worthwhile programs. 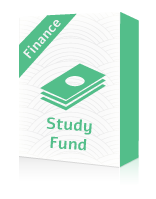 What does study fund cover? A study fund is the most worthwhile savings’ tool available in the country today, both for the employee and the self-employed. Profits from these funds are the only profits from investment exempted from the capital gains tax. Therefore, now is the time to deposit as much as possible in them. A study fund is a medium-term savings program of several years duration and is an efficient tool for managing household saving.